Tamika Bassman is the co-president of Students for Life at Berkeley. Secular Pro-Life's Monica Snyder interviewed her about the ups and downs of that experience. Enjoy! Q: What does the term "pro-life" mean to you? A: To me, being “pro-life” means that I strive to support the fundamental human right to live for all human beings from conception through natural death, regardless of stage, age, ability, or circumstances. This is what I believe to be called the “consistent-life ethic” in some pro-life circles. I do understand that there are people who identify as “pro-life” but would not agree with all of the ideas underlying the consistent-life ethic. It’s my opinion that debates and controversies surrounding life- and choice-related issues such as the death penalty, euthanasia, and abortion ultimately circle back around to a fundamental question of what makes a human being human, and what aspects of societal organization are compromised when you remove the foundational human right to life. I think “pro-life” connotes the defense of the human right to life. Q: How did you become pro-life? A: I first remember hearing the term “pro-life” from my eighth grade teacher at my Catholic elementary school. At the time I must have had no better than a rudimentary idea of what abortion even was, but one of my clearest memories is hearing my teacher say to another student in the class that she would gladly defend the pro-life position to anyone. It was a few years before I had fully explored the pro-life argument to the point where I could say with confidence that I myself was pro-life, but I think it really was hearing someone I knew and greatly respected be so steadfast in her pro-life beliefs that set me in motion to figure out my own beliefs. In my senior year of high school, my government class held a Mock Congress in which the entirety of the senior class convened for a pseudo-congressional session, hearing students present bills they had written, debating each bill, and voting on each. I wrote a bill that called for ending federal funding of embryonic stem cell research, which ended up getting chosen to be presented at the Mock Congress before my class and a number of teachers. In hindsight I think this was my first step towards defending the pro-life perspective in a secular and majority-pro-choice environment, which describes my high school class as well as the climate at Berkeley. Q: How did you get involved with Berkeley Students for Life? A: I joined Berkeley Students for Life my freshman year because I wanted to get involved with a group of pro-life students, which was not something I had ever really experienced prior to college I’ve been a part of the club ever since! Q: How long have you been President of the group? What has that been like? A: I became co-president alongside Daniel Frise at the start of the fall 2018 semester, so quite recently. I am happy to have been able to step up in participating in and representing Berkeley Students for Life. The role definitely has its challenges; it’s difficult at best to rally an already small percentage of pro-life students on campus, especially when Berkeley culture tends to encourage everyone to study unceasingly. We also had a number of very active students graduate at the end of last spring, so recruitment and rebuilding are two larger priorities for our club this year. Our Students for Life of America advisor (Anna Bakh) has provided invaluable help and encouragement for us in this process. Q: What motivates you to stay involved with pro-life work? A: To paraphrase something I remember reading out of Trent Horn’s Persuasive Pro-Life, the issue of abortion can be seen fundamentally as pretty black-and-white, even though arguments for and against it in various cases quickly get complex. Either abortion does not kill an innocent human being, and most all of the arguments and concerns brought up by the pro-life movement are largely inconsequential, or abortion does kill an innocent human being endowed with the right to live, and abortion is among the largest human rights violations in history. It is difficult to comprehend the sheer gravity of what is at stake in the movement to make abortion both illegal and unthinkable, even before adding on other issues which compromise the fundamental right to human life such as euthanasia and the death penalty. So in that way, the issue itself is what motivates me to stay involved in pro-life work: the millions of innocent human lives which have no means of defending themselves against their own parents and medical practitioners. They unknowingly rely on strangers who will likely never meet them but are dedicated to ensuring their right to life is protected. As I implicitly already mentioned, I also think that the goal of making abortion “unthinkable” (shout-out to Kristan Hawkins and Students for Life of America) as opposed to “merely” illegal demands those of us who are pro-life to be committed to our activism. We know that laws are destined to be rewritten at the whims of the political climate but that individual perspectives and beliefs constitute the mindset of an entire society. Finally, this year in particular, following the large pro-life conference which Berkeley Students for Life co-hosted with Pro-Life San Francisco on our campus, my eyes have truly been opened to the amazing diversity of the pro-life movement. We have so many passionate pro-lifers from all walks of life that differ in so many ways but are united by a common belief in the importance of protecting the universal human right to live. I think our diversity is a really important asset that we need to better explore as we sort out our differences between each other so that we can really reach out to and relate with as many different pro-choice people as we can. Q: How does the group recruit members? A: A number of methods. Time has proven to me that passionately pro-life students crop up all over the place, and in unexpected places! This year, as we try to rebuild membership, friends of friends have been an important way that we have recruited new members. The conference we held on campus in September was also an important way that we got our name out there to more new students. We also do the typical tabling events at the start of each semester where nearly all the student organizations on campus go out to recruit. Q: What does the group do? What are some of your projects? A: Our smaller-scale, more regular events have historically been weekly meetings for our members to have discussions on various life-related issues, as well as tabling on Sproul Plaza, the main thoroughfare through campus that gets the heaviest foot traffic. 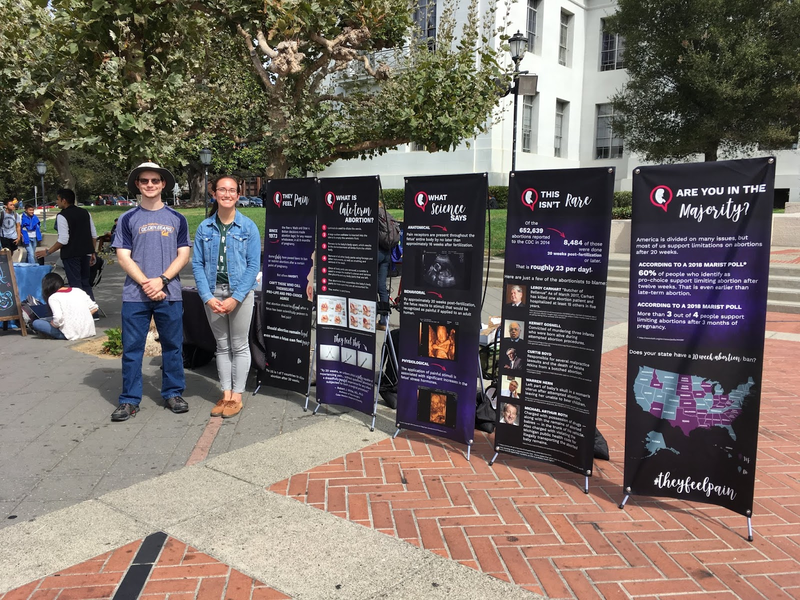 We have held larger poster displays on Sproul Plaza from Students for Life of America with our advisor Anna, which have been great at stimulating conversations with students and getting thought-provoking questions and images into the minds of passers-by. Each semester, we host a pro-life speaker to debate a pro-choice public health professor as part of a public health ethics seminar, and we also occasionally bring other speakers to campus as well. We bring a group of students to the Walk for Life each year and attend occasional pro-life conferences in the area. This year was our first year holding a conference ourselves with Pro-Life San Francisco on our own campus. It was a great success, so we’re hoping it’s an event that will continue to happen in the future! Q: Do you tailor your efforts to a Berkeley student population? If so, how? Which efforts have been the most useful/effective? A: Berkeley’s campus is a generally left-leaning, secular one, including the student government and student newspaper (though I would be remiss to say that there are not large minorities which do not identify with this majority). While UC Berkeley has a history of being the home of the free-speech movement and open sharing of (often radical) ideas, this precedent has definitely been put to the test by the treatment of more conservative student groups, leaders, and organizations. The sensitivity of the campus climate to certain materials, images, and words means that we definitely have to be careful with how we phrase and present ourselves publicly to the student body, or else risk being dismissed all together by the very people we’re trying to reach. I’ve found that the best way to get students to even look at our tabling displays is to simply be calm and reasonable and to present our position in an open-ended way, often in the form of questions on the flyers we hand out or on the posters we display. This seems to let students who may not be pro-life contemplate something they see for themselves, rather than feel barraged by insistent student-activists. Q: Do you have any projects focused on getting resources to pregnant/parenting students? A: In the past our club has held diaper and supplies drives for the on-campus Student Parent Center. We also try to spread word when possible in tabling events about life-affirming pregnancy resource centers such as Support Circle. Q: Do you interact with any student government leaders? If so what has that been like? A: This last fall semester has in particular been an interesting one for UC Berkeley’s student government. One of our own Berkeley Students for Life club members and officers, Isabella Chow, is also a Senator in the ASUC (Associated Students of the University of California) and came under considerable fire from the ASUC and hundreds of protesting students when she abstained from voting on a senate bill which involved statements surrounding the Trump administration’s proposed changes to Title IX. Daniel gave a very coherent speech in defense of Isabella’s actions at an ASUC hearing, and the both of us have done what we can on social media and in conversation with other students to support her and more broadly the free communication of minority opinions on our campus. Q: Is there a plan to get more liberals and/or secular people involved? A: Diversifying our club is definitely a priority built-in to the rebuilding we plan to do this year. When I joined Berkeley Students for Life my freshman year, Catholic students made up the majority of the club. Though I see nothing wrong with that, as most of these students graduated, now is actually an opportune time for us to really try to reach out to other communities on campus as well. Q: How can older generations support pro-life college groups and their efforts? A: We definitely appreciate when they keep updated on the major events on campus and offer us advice as far as methods of outreach and recruitment. Our club over the last decade or so has taken up a number of different tactics for tabling and recruitment from more experienced pro-life activists and supporters, and some of these methods were more effective than others. I think that any and all advice and support we can get from pro-lifers with more experience is helpful, though ultimately how we choose to implement the ideas and strategies of our mentors may vary based on the particular climate of Berkeley’s campus.